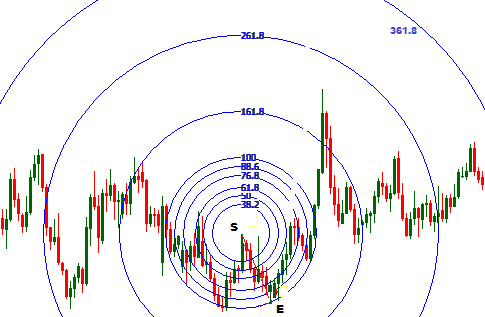 Traders are often confused to determine the difference between fibonacci spiral and fibonacci arcs. A fibonacci spiral changes the radius every moment it go longer, but the radius of fibonacci arc is constant. 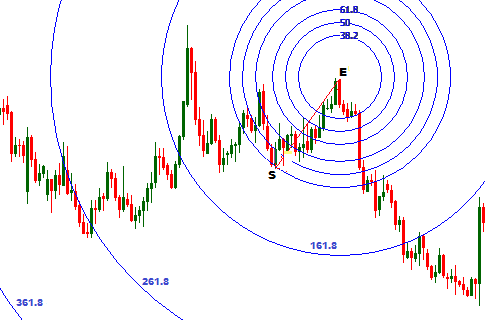 This post is written to explain the way to trade with fibonacci arcs. Fibonacci arcs are drawn connecting a low and a high of a swing. It is very similar to fibonacci retracement, but the difference is that the fibonacci retracement only considers the price, but the fibonacci arcs consider both time and price. Let see in the illustration above, where fibonacci arcs are drawn, connecting the S and E points that denotes a low and a high of a bullish swing respectively.S represents the starting point, and E represents the ending point. We can see at the highlighted points fibonacci arcs represent strong support. 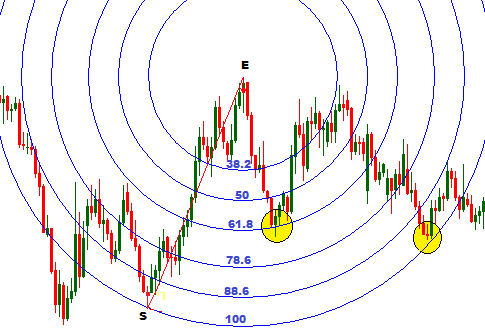 In the above illustration, fibonacci arcs are drawn, connecting the S and E points, which denotes a high and a low of a bearish swing respectively. S represents the starting point, and E represents the ending point. Here at highlighted points the fibonacci arcs represent strong resistance. In case of above two situation, the arch that showing 100% fibonacci retracement level in circular form has the largest radius. In real market, very often we get the larger swings following smaller swings. In that case, we may find fibonacci arcs at larger than 100% fibonacci retracement level. Look at the above illustration, where fibonacci arcs are drawn connecting the high and low of a smaller swing. 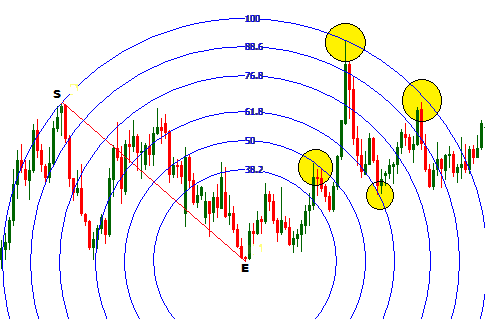 Here the fibonacci arcs represent resistance levels. In the above illustration, we find the support levels at larger than 100% fibonacci retracement for a bearish trend, using a smaller swing. In case of arcs with smaller swing, the 161.8-361.8 fibonacci retracement levels show the higher support and resistance. Okay, now we know the way to draw a fibonacci arcs and how they indicate support and resistance levels.This tool should be accompanied by other technical analysis tools and indicators to find better result. If you have any questions regarding fibonacci arcs, just drop a comment below. I will surely answer your questions within 24 hours. Most professional forex traders spend their time analyzing time frames of the four-hour chart and higher, the one-hour time frame can be useful for refining entries, but anything less than this and you are simply rolling the dice.